again. Only a half hour start to finish, and pretty darn good. Try this at home. If you want to make it just a bit more authentic and a point or two higher in WW value, , use boneless, skinless chicken thighs instead of breasts, and regular brown sugar instead of Splenda brand. Otherwise, its a pretty good home-made chinese supper. In a medium bowl, whisk together broth, flour, sugar, soy sauce, vinegar and ginger; set aside. Heat oil in a wok or large skillet over high heat. Add chili peppers or red pepper flakes and stir fry them until they turn black but not burned, 30 – 45 seconds. Add scallions and garlic; cook, stirring frequently, about a minute. Add chicken; sauté until browned all over, about 5 minutes. Remove the chicken to a bowl. Add 1/4 cup water and the broccoli florets to the wok, cover and steam three minutes. Place the chicken back in the wok. Reduce the heat to medium high, add the reserved sauce to the wok and cook until sauce thickens and chicken is cooked through, about 3 minutes. Serve chicken, broccoli, and sauce over rice. 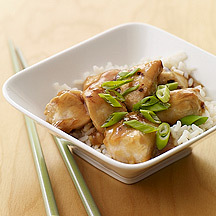 Yields about 1 cup chicken with sauce and 1/4 cup rice per serving.